You know what’s even better than grilling on a pile of hot coals under the sun with friends and family? The answer is doing all that, but on a barrel grill you handcrafted yourself. I consider myself a DIY handy person. I don’t shy away from picking up the tape measure and grinder when needed, so this is something that I’m really looking forward to sinking my saw’s teeth into! Today we’re going to make a 55 gallon drum grill grates. So what’s needed to create the greatest portable outdoor grill experience? Now for the base, it’s time to get creative. For me, I will be using some old plywood that I have in the garage around with some steel foundation poles that have been laying round the back of the house for longer than I’d like to admit- I knew they’d come in handy! In truth, your own judgement will be the best way to decide what’s going to be best for your homemade barrel grills. There’s no need to go out and buy expensive materials if you’ve got something laying around out back that does the job well enough. We’re going to start by creating the opening in the barrel. I’ve seen a couple of different ways of doing this but in my opinion, I want to try and keep as much of the barrel intact so that there is no strength lost and less chance of it flexing during transportation. If you take the barrel so it’s resting on one of the circular ends, you can mark out one quarter of the circumference and then using a spirit level, mark along the body of the barrel in correspondence to where your marking are. This way, you can see how much of the metal you’re going to grind off in order to make an opening. Using a grinder, carefully and slowly work along the markings until you’ve lost a quarter of the barrel’s body like in the picture above. Next, you’re going to have to give it a good scrub. Don’t hold back and make sure you get in everywhere. A deep soapy clean is needed just to take out anything nasty hidden in there. As long as the surface is clean that’s good enough for now, after the build is done, we’ll be creating a fire in there anyway to burn off any lurking hazards. Now we need to create the stand. This is where you’ll have to get imaginative as there’s a few different ways of doing this and your materials will ultimately dictate the stand that you end up with. This is the stand I’ve decided to go for. 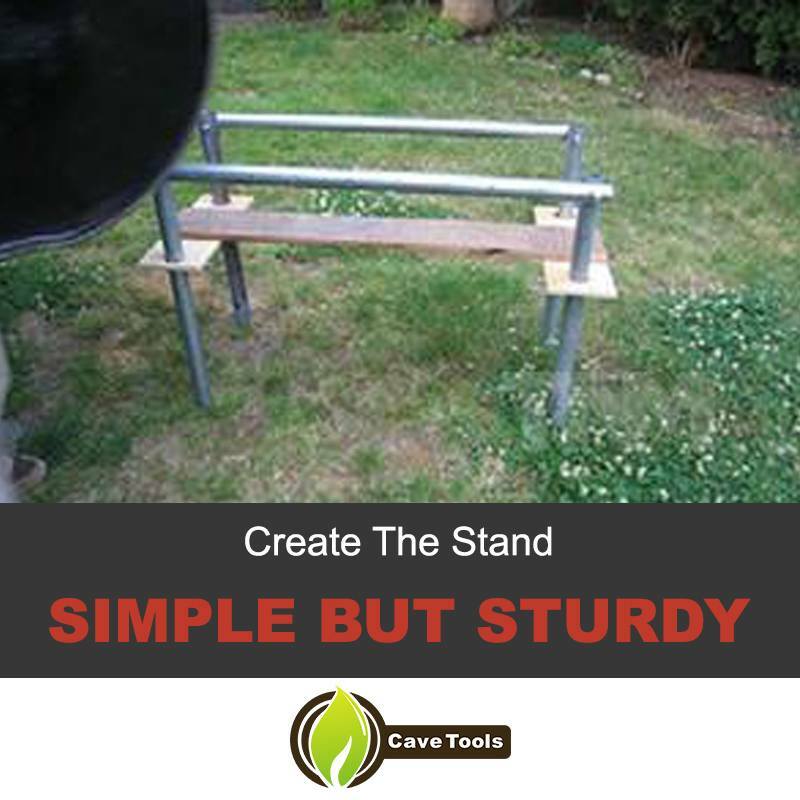 It’s simple but sturdy; great for weekend getaways as the wood doesn’t have as much weight as it would if was using more metal. If you haven’t got any wood to act as support, then metal poles or strips are just as good. The main thing is to have 2x poles that are just slightly longer than the length of the barrel and then 4x poles that are around a meter long; unless the chief griller is either a little shorter or a little taller. If this is the case, then choose the length of the legs wisely. Then you’ll need two support trusses to keep the legs together if you’re not using wood. If you are using wood, then don’t worry about this for now, we’ll get on to that part shortly. The poles are attached to one another with a long bolt through, then washer and finally bolt. Drill carefully into the metal and always use a cobalt or titanium drill bit to ensure you don’t break your drill. The barrel supporting poles go on the inside of the legs, right at the top. Be sure to measure and then measure again the width of the barrel before you cut any poles or wood to hold the two uprights together. If you’re using poles to connect the two, then attach the connecting poles across about halfway down the legs. If you’re using wood, then you’ll need the jigsaw in order to cut holes like in the picture above for the poles to slide into. The wood can be slid up the poles from underneath and then rested on u bolts brackets so that they don’t move around and ensure the whole structure is solid. Now we’re going to be drilling and setting the holes for the grill grates as well as the hinges for the lid. Using the same drill as you did for the poles, carefully go about drilling and making holes like in the picture below that makes a much better job of instructing than I ever could with words! Now it’s time to sit the empty barrel on top of your frame and make sure your measurements and cuts were correct. Also, test the stability of the frame with a little weight in the barrel and a rock on all four legs to make sure that your great outdoor grill isn’t going anywhere once grilling classic outdoor grilling recipes. Once everything seems sturdy enough and you’re happy with how it feels, it’s time to burn out the insides of the barrel by lighting a fire with some charcoal on the insides. Be sure to let that burn out fully as you’ll be getting rid of any still-existing toxins that are definitely not welcomed once you start cooking on your homemade barrel grill! Finally, the last bit! This bit is the cool bit too. Now you can paint the bbq grill to whatever you want. Just be sure to use a high heat resistant paint otherwise it won’t last very long once you get the grill grilling in your outside barrel grill! And that’s it! Now that you’ve got yourself an awesome outdoor barrel grill, you’re set for your pit master style grill up! Of course you can just shop grills or find on craigslist for your first time, but what’s fun in that? Just make your own! 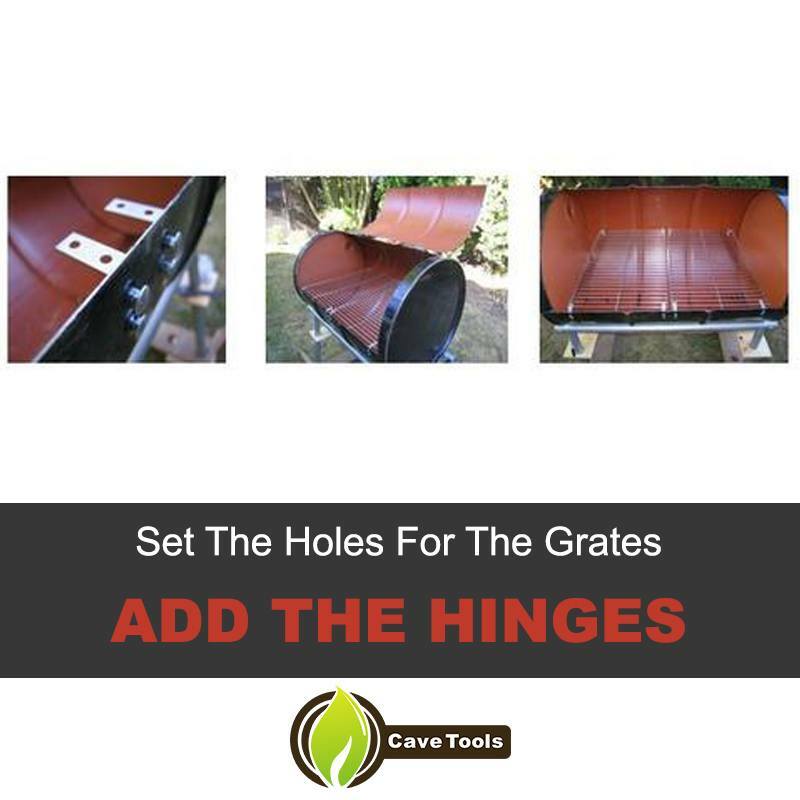 Just to be sure, you can stock up on replacement parts and grill accessories, who knows, maybe your friends will ask for your help to build their own 55 gallon drum grill grates! Be sure to get the beers on ice nice and early, and don’t forget to invite lots of people over to christen your backyard barbecue beast! What is a barrel barbecue? A barrel barbecue is a grill made from a 55-gallon drum barrel. Some people turn them on their side and cut a lid, using them in a vertical position. Other people simply put racks inside the upright barrel and create a lid for the top. Read our guide above to learn how to make your own! 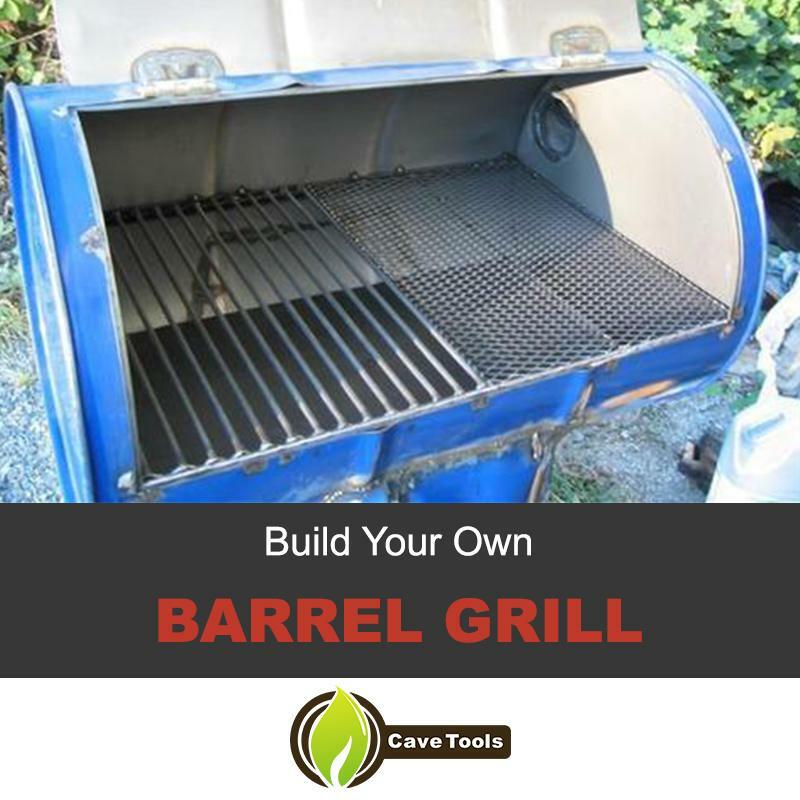 How do you clean a barrel to create a barrel grill? It’s important to clean the barrel out before you start using it as a grill. The easiest way to clean it is to create the opening in the barrel first. Then, you’ll have plenty of room to get in there and scrub it clean. You may need to scrub it a few times with a stainless steel scrubbing brush and hot, soapy water to get off any lingering residue. What’s the best way to get grill grates inside a barrel grill? Whether you’re using the upright or vertical method, you’re going to need to insert grill grates in this barrel for it to become a grill. We like using a drill to create the holes, and then we screw in some brackets that will hold the weight of the grates. Can you paint a barrel grill? Absolutely! Painting your barrel grill makes it uniquely your own. Make sure you look for heat-resistant paint, otherwise it will start to chip off as soon as you use your grill at higher temperatures. How much does a 55-gallon drum barrel cost? Depending on where you look, you can find used 55-gallon steel drum barrels for as little as $20. We’ve had great success locating these types of barrels on ebay.